2010 September 03 » Change Myself. Change the World. At Regionals, I noticed the girls of CrossFit have a particular style. Along with their short shorts, several female competitors wear knee high socks. I really thought it was just some kind of fashion statement or something, girls being girls, like me putting pink laces in my lifting shoes. After attending my 3rd competition my legs are covered in scratches and bruises from scraping weightlifting bars and kettle bells against my shins and climbing the ropes at the gym. I now realize the socks, however bold, may have more practical purposes. Probably more of a fashion risk than a statement but I went ahead and finally bought myself these three pairs. I hope they help! 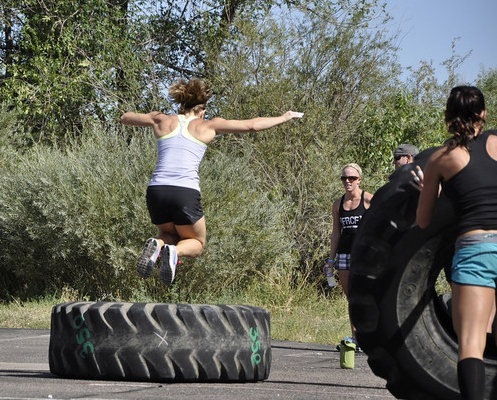 This past weekend was the Colorado CrossFit Open. I had no idea what to expect so my original goal was to be in the top half. I ended up in 9th! What really made it fun was that we had a lot of people from our own gym competing. Quite a few people came out just for support, other gym members, friends, my whole family. I even ran into some volleyball girls there. Small world! Anyway, everyone from Flatirons who competed did exceptionally well. I was really proud to be a part of that group. What a bunch of studs! I need to add more pictures here are a few: Colorado Open Day 2. Monday I was completely wiped out. For dinner I caved big time and had pizza. I dipped the crust in ranch dressing because I didn’t have enough honey. Then I ate a Snickers ice cream bar for dessert. I can hear the others from my gym cringing. Needless to say, after a meal like that I didn’t feel much better on Tuesday. It was pretty obvious I needed to get the diet back on track so I made baked scallops. Pour melted butter into a 2 quart oval casserole dish. Distribute butter and scallops evenly inside the dish. Combine everything else and sprinkle this mixture over the scallops. Bake in pre-heated oven until scallops are firm, 15-20 minutes. 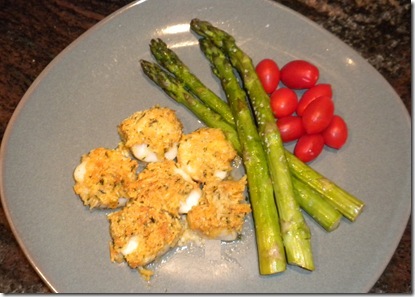 For the asparagus I brushed them very lightly with oil and sprinkled sea salt on them. I baked them in the convection oven for about 8-10 minutes. Then I allowed the excess butter from the baked scallops to run underneath them.